The Law Office of Harry W. Haskins, P.A. offers a variety of legal counsel in civil trial, personal injury, patent protection, commercial litigation, and real estate litigation and title. When disputes arise, you and your business require a legal team with the experience, knowledge and skills necessary to successfully litigate the matter until it is resolved. 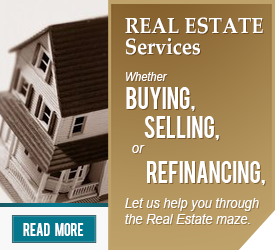 We are ready to represent your needs, buying or selling, working independently or with a realtor. 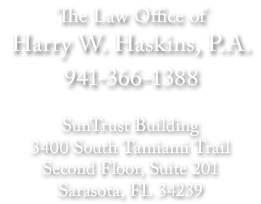 If you need legal assistance in any of these areas, contact Haskins Law at (941) 366-1388 or send an email to hwh@haskinslawfirm.com.